Masa Son has brought his billions to Compass. What happens next? A five-year-old New York-based residential brokerage has now raised more than $750 million in venture capital. Let that sink in. Just a month after raising $100 million in a Series E round, Compass received a $450 million infusion from SoftBank, the company announced Thursday, giving it a new valuation of $2.2 billion. The capital makes Compass the richest brokerage in the country – no one else even comes close– and sets it up to make a flurry of acquisitions in coming months. In this, it mirrors WeWork. The shared-office space company hit a valuation of $20 billion earlier this year after its most recent investment round, also led by SoftBank, a Japanese conglomerate that is transforming the world of venture capital through its $97.7 billion Vision Fund. Since launching in May, the fund — the world’s largest corporate venture capital fund — has invested north of $19 billion in 16 companies ranging from robotics to ride-sharing to real estate. After pouring $4.4 billion into WeWork in August — and now pledging another big sum to Compass — SoftBank may be seeing real estate as the next big thing. “Real estate is a huge asset class, but the sector has been relatively untouched by technology and remains inefficient and fragmented,” Justin Wilson, a senior investment professional at the Vision Fund, said in a statement Thursday. Founded by Masayoshi Son in 1981 as a software and media publisher, SoftBank was worth an estimated $180 billion by the late 1990s before it lost 99 percent of its value during the dot-com bust. 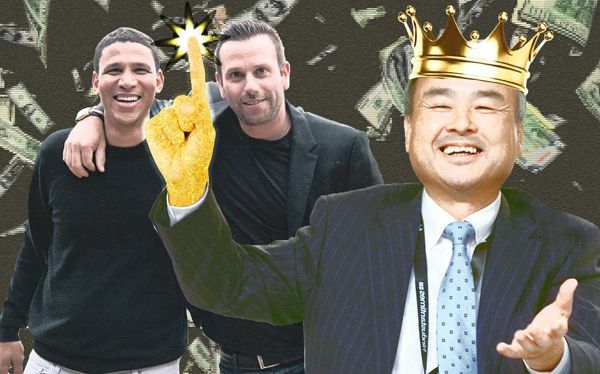 But Son, known widely as “Masa,” who reportedly lost $70 billion himself, managed to salvage the company by betting big on Japan’s broadband market. He is now the richest man in Japan. In 2006, Son paid $15 billion for Vodafone’s telecom carrier unit — which today is one of SoftBank’s most profitable business lines. Son then made the mother of all prescient bets, on an upstart Chinese e-commerce company lead by a Tai Chi enthusiast called Jack Ma. Ma’s company Alibaba, now has a market cap of nearly $450 billion, and Son’s $20 million investment in the company is now worth an estimated $139 billion. Through the Vision Fund, Son hopes to shape many of the country’s most buzzed-about companies. He takes positions that allow him to shape the companies he’s investing in. “Most of our investments will range between 20 and 40 percent, making us the largest shareholder and board member, in a position to discuss strategy with the founders,” Son said earlier this year. Backed by $28 billion of SoftBank’s own capital, the fund’s other investors include Saudi Arabia’s Public Investment Fund ($45 billion), Abu Dhabi’s Mubadala Investment Company ($15 billion) and companies like Apple ($1 billion). SoftBank itself is one of the most exposed investors in its fund. The unusual structure means the company, which has a one-third stake in the fund, would receive more than half of its gains if the fund triples in value, according to an analysis by tech news site the Information. So far, the Vision Fund has made a $3 billion profit and a 22 percent return over a five-month period, Son said last month at the Future Investment Initiative summit in Saudi Arabia. He also said the behemoth fund is just a starting point for SoftBank’s tech investments. In 2015, SoftBank was part of a $13 million funding round in the research and data startup Reonomy. That same year, it led a $1 billion funding round in the online lender Social Finance. This February, it ponied up another $500 million for SoFi, but the company was recently rocked by a sexual-harrassment scandal and has pulled back on its expansion plans. In August, the Vision Fund invested $4.4 billion in WeWork, an investment that, according to Forbes, came together when WeWork CEO Adam Neumann joined Son for a car ride. SoftBank has also said it plans to acquire Fortress Investment Group for $3.3 billion cash. The company’s appetite for real estate technology investments comes from Son’s vision of an “information revolution” that will change the global economy, sources said. It’s “trying to capitalize on the shared economy and tech-enabled services that are disrupting entrenched, legacy businesses — whether it’s transportation or real estate,” said Zach Aarons, co-founder of MetaProp, a New York-based real estate tech accelerator. But not all bets have paid off. SoftBank led a $90 million round in the Indian real estate portal Housing.com in 2014, but after the site ran into trouble, the company advocated for a merger with a competitor. “SoftBank knows when to pull its support back,” Jaspreet Saluja, founder of Housing.com, told The Information in September. And while Son’s been compared to Warren Buffett, the “Oracle of Omaha,” investors don’t have the same confidence in his bets, according to Chris Lane, an analyst at Sanford C. Bernstein & Co.
Sources speculated the funding would accelerate Compass’ plans for an IPO. “They’re going to try to go public really quickly and they’re building a war chest to do that,” one venture capital source said. But the source noted that SoftBank’s investment was probably “expensive money,” meaning it came with highly-favorable terms for the fund. “[SoftBank] is a very savvy, very savvy investor,” the source said. In the residential brokerage world, traditional firms share a similar feeling about Compass. The firm’s unicorn status, in particular, has riled real estate competitors who say firms ought to be measured based on their earnings. The latest valuation “makes no sense,” one brokerage chief told The Real Deal on Thursday. Warburg Realty’s Clelia Peters said Compass has forced more traditional brokerages to get with the program. Compass said it would use the SoftBank investment to turbo-charge its goal of being in every major U.S. city by 2020 — a target the company set earlier this year. The firm, which has more than 2,100 agents, currently has offices in 11 regions, including New York, Los Angeles, San Francisco, Boston, Washington, D.C., Miami, Orange County, Calif., the Hamptons, Santa Barbara, Montecito and Aspen. It launched a Chicago office last week. On CNBC, Reffkin said Compass is on track to be the “largest owner of real estate data globally and the No. 1 real estate tech company in the world” thanks to an end-to-end business platform for agents. “That’s just not something brokerage firms are doing,” he said. On paper at least, the cash infusion means Compass’ valuation has moved past that of Redfin, another firm that’s billed itself as a technological messiah for real estate and raised significant venture capital before going public this summer. Redfin’s market cap was $2.04 billion as of Thursday morning. Most signs now point to an IPO for Compass. At $2.2 billion, its size disqualifies most acquisition suitors, said Aarons, noting that the largest potential buyer in the real estate space — Realogy — has a market cap of $3.71 billion.